I was prescribed this by my dermatologist because of my keratosis pilaris on my legs and this is the only thing that works. I use the body wash with a Salux "washcloth" (for lack of a better term) instead of with the puff that comes with the kit. I use the body wash once a day and the body moisturizer twice a day. I have only had this for a little over a week but the results are phenomenal! My skin is noticeably softer and some age spots on my chest are fading. This combination kit works wonderfully to exfoliate dry skin. I use the two products beginning in late fall and continue through the winter to prevent and correct seasonally dry skin. I also have some small bumps on the backs of my arms, triceps area, and they are markedly reduced with regular use of the kit. I recommend the kit for anyone suffering dry skin as well as keratosis pilaris. 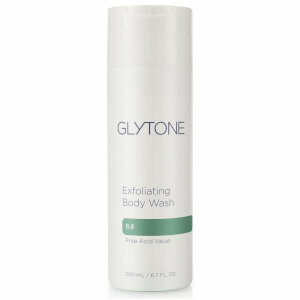 IÃ¢â‚¬â„¢ve been using Glytone products for years because I canÃ¢â‚¬â„¢t live without them! The keratosis kit keeps my arms, legs, and overall complexion looking smooth, exfoliated, and healthy. I recommend this product to everyone I know who suffers with rough spots. This is the only product that I have found that works for my KP. I've tried a ton of other products from expensive to cheap to natural remedies. This is the only thing that works. This kit softens the bumps almost immediately. Of course you have to continue to use it or the rough bumps come right back. The only complaint is the pump on the lotion bottle which has broken on several bottles, bad design I guess. Never stop making this!!!! The body wash & lotion helped remove smaller patches of Seborrheic Keratosis (bumpy, scaly brown spots) - it didn't happen overnight but with several months of continued use. Plus, the ordinarily rough, dry skin on my elbows & feet are now as smooth as the proverbial babies bottom!!. Highly recommended! I occasionally get dry, rough patches or ingrown bumps on my legs and this definitely takes care of that issue. I would recommend this to be used on intact (no open sores) skin only. I purchased my first set in 2008. I've had KP my entire life and I thought the bumps were ingrowns from shaving. I actually spent a decent amount of time with tweezers pulling the hairs out. DO NOT DO THAT. In 2008 I went to a dermatologist and my life changed. Not only did the skin on my face change significantly, I also asked my derm about the bumps on my arms and legs. She told me it was KP and recommended this kit. Within a few weeks of use, the skin on my body transformed. The bumps on my arms are completely gone and the skin is super smooth. There are still some bumps on my legs, but they are no longer noticeable and the skin is very soft. Don't use right after shaving, it burns! I would recommend using the wash before shaving and don't use the lotion for that day. Definitely don't use it on a baby (I read that in someone else's review). I would suggest consulting a dermatologist before using this if you're not sure if you have KP or not. My dermatologist suggested I use this for the acne and dark spots I get on my back. I do not have KP. It works really well. I can tell a huge difference when I run out and take too long to order more. I was tired of not being able to wear what I want because of bumps. It does burn for the first little couple weeks when you put it on, but works really well. While reading all the posts, it is evident that this works for some and not others. For me it works!! After one week I see tremendous improvement in how soft my arms are and alot of the redness has faded. I do realize that I will have this the rest of my life, but to find a product that works so that I am not so self conscious about wearing short sleeves is great. This is a great product and I would definitely recommend it.